Tuzigoot White-on-red bowl, Tuzigoot National Monument. Click the image to open the Tuzigoot White-on-red gallery. 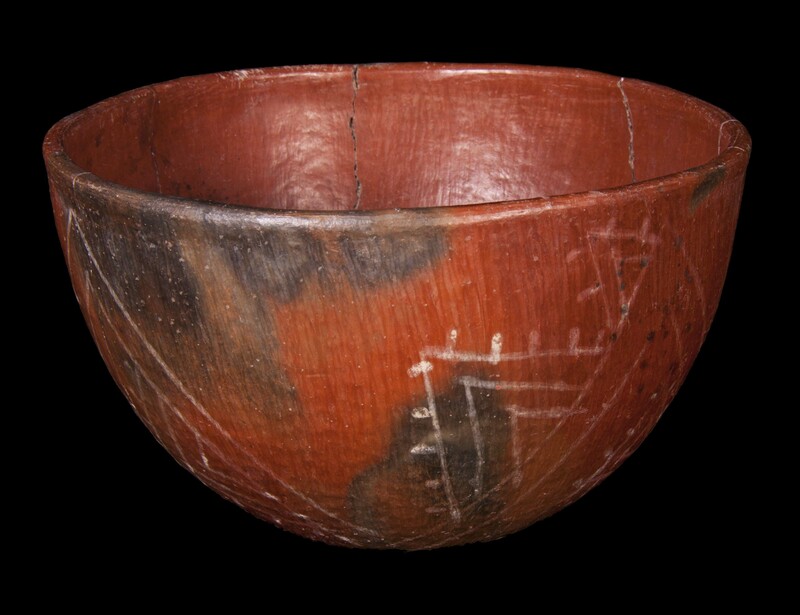 Tuzigoot White-on-red is the decorated type of Alameda Brown Ware found in the Upper Verde Valley drainage, from Beaver Creek to at least Sycamore Canyon, and down to the Prescott area, Arizona. Design: Jar and bowl exteriors, and bowl interiors: medium to wide parallel lines, pendent dots, groups of large dots, irregular meanders, and zigzags. Execution is generally poor. Comparisons: The temper of Turkey Hill White-on-Red is predominately opaque angular fragments with very little quartz sand, the core texture is usually coarse, and the vessel walls average thicker. Bowl interiors are almost always smudged and well-polished.